"Spice up your day" on a cloudy day. 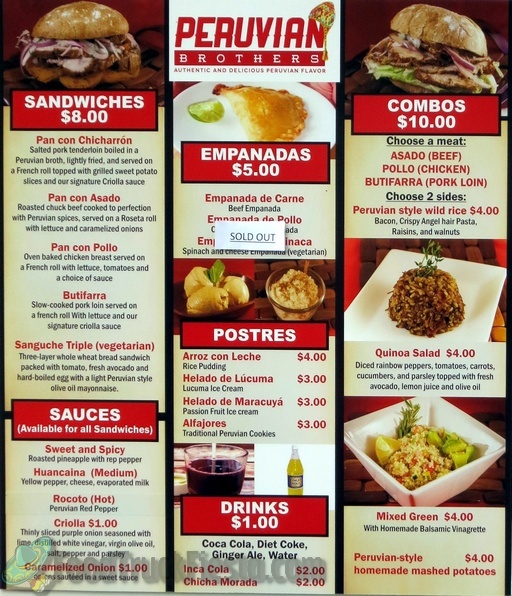 Buy it online #RocotoHotSauce at https://t.co/tk2f5KZXB0 " PB # 1: Farragut... https://t.co/H90oFiw3ac"
I ordered the pollo combo with mashed potatoes and salad. The service was very friendly but took a lot longer than expected. I know the food was already prepared so I have no idea why it took so long to put my plate together. The food was very good but I was a little upset it did not stay warm on my 10 minute walk to my office as it was hot outside. The chicken was very moist and delicious. The mashed potatoes were buttery and not too salty. The salad was just salad but I wanted something green so it served it's purpose. I am definitely going to try another type of meat from this food truck as I enjoyed the food. Terrific customer service. Fast, friendly, and efficient. The chicken sandwich was simply out of this world. Fantastic flavor. The chicken was perfectly cooked, and the bread was killer. I wish I could say the same for the beef sandwich and quinoa. Both were pretty bland. This was my first sandwich and it was very good: great bread, very tender pork (no gristle at all), and nice spices. Would have liked a little more kick to it - so next time I'll try one of the sauces they offer. Would love to see them offer anticuchos and picarones! May 06, 2014 by H.S. The quality of the food here was great, but the Pork Combo was a little bland. It was tender and seasoned great, but dry without a sauce. It needed some kind of sauce. The rice pudding was delicious. I would try this again at a later date. I had the veggie sandwich and enjoyed it but it was WAY too pricey for a vegetarian sandwich. It is the same price as all of the meat sandwiches and that is ridiculous, when I compare what I got (simple thin whole wheat sliced bread with boiled egg and veggies) with my friend's meat sandwich (huge thick roll packed with meat. It was a nice sandwich and had a good flavor but worth only about $4-$5 - NO WAY I will pay $8 for that again. The pork in the sandwich was so tender and flavorful. After I started eating it my co-workers commented on how good it smelled. The wild rice was delicious and the combination of the ingredients worked wonderfully together. I obviously ordered too much because I haven't dived into the arroz con leche yet! I will be back and I will bring you some more customers! Did my lunch really came from a truck food? It felt more like I had just purchased a delicious, perfectly portioned entree from a nice restaurant. Even though the food came in a box, it was nicely arranged, without being soaked in sauce and the salad dressing came on a separate container, just waiting for the perfect moment to be poured over fresh greens. The dessert was also amazing and it reminded me of the rice pudding my mom uses to cook. Did I mention the food was delicious? I hope they will be coming back soon to the corner of 21st and L. I just can't wait to try the other dishes and desserts! The food is very delicious, and healthy! There are so many wonderful flavors! I will definitely place this in my top three! Will definitely be back again! The pan con chicharron has a lot of potential, what with flavorful meat, fantastic bread, and tasty sauce, but the overall flavor profile didn't quite work for me. I would have preferred a different sauce (probably their sweet and spicy), but I decided to order as suggested on the menu. I liked it enough to give the Brothers another shot. Speaking of the brothers, Giuseppe is incredibly friendly, likable, and helpful. You don't always get that from food vendors (trucks or otherwise), so I thought it worth noting. I ordered the Asado combo w/ mashed potatos and wild rice. I was bummed that the meat was not on a sandwich. The photo of the sandwich on top of the combo section of the menu is misleading. You do not get a sandwich with your combo. The asado was very dry and salty. No flavor other than the salt. Had to force myself to eat it. I regret not buying the extra sauce that they sell. On the other hand, the wild rice and mashed potatos are very good. I might try them again and get something besides the Asado. 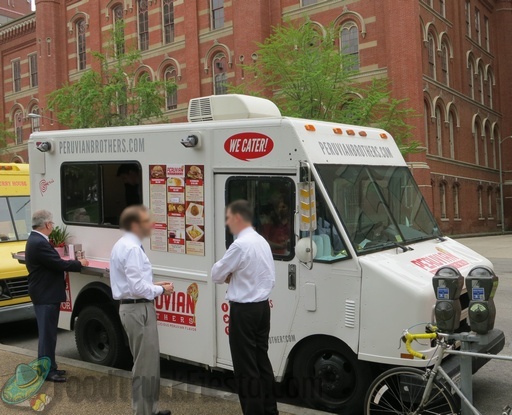 Peruvian Brothers DC food truck serves authentic and delicious Peruvian flavor.